There isn't much going on in Motorcycle land. At least here in America. 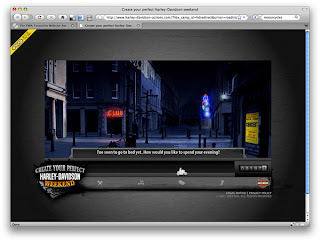 Harley has a Choose Your Own adventure video site up in Europe. Create your Perfect Harley-Davidson Weekend. Tour around little towns in europe, camp, etc. How quaint... There isn't any real product info, and all you see are some quick cut shots of a bike. Maybe there's more at the end ... but like any trip, I usually vere off and head for the local pub and never come back out. cheers. I will probably not being doing a series on the Insurance industry. Something tells me that it would be another boring week. But All State does have some interesting things going on, coicidentally around motorcycles. 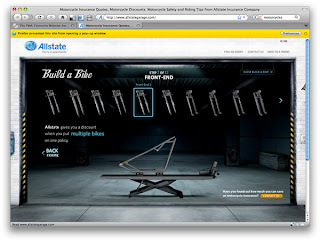 At the All State Garage you can build your dream bike from the ground up. While you're picking parts, they use the time to tell you facts regarding All State insurance. Smart use of the journey. again, i didn't follow through to the pay-off. it's friday!